This dazzling diamond bridal set from Perfect Fit is set to steal her heart. Crafted from gleaming 9ct yellow gold, this set features an engagement ring with a captivating emerald shape cluster of sparkling diamonds, complimented by additional set stones upon the shoulders. 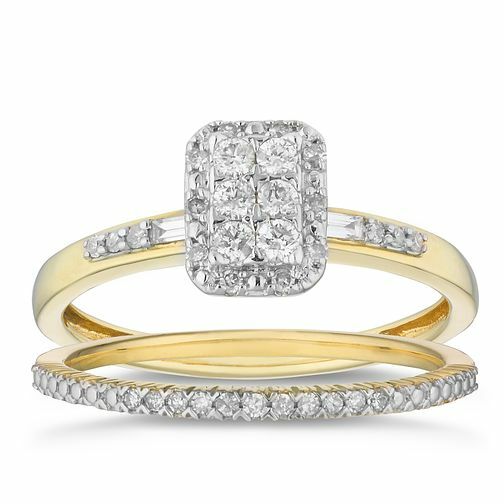 This set is complete with a divine diamond set wedding band, a glamorous and classic pairing to celebrate your love with. The total diamond weight of this bridal set is 0.25ct.